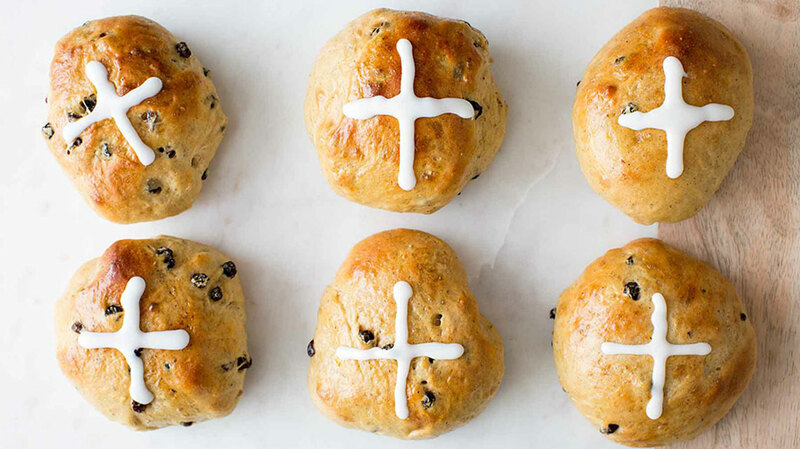 In many historically Christian countries, including ours, hot cross buns are traditionally eaten on Good Friday and the weekend of Easter, with the cross standing as a symbol of the crucifixion, but they have also become a tradition of springtime sales for many bakeries across the world. The slightly sweetened yeast buns studded with raisins are noted for the white icing cross across their tops, and are delicious served warm with butter for a coffee or teatime treat. The first mention of “hot cross buns” seems to be around 1733, but when the buns became so popular, Protestant monarchs saw the buns as a dangerous holdover of Catholic belief in England. An attempt was made to ban the sale of the buns by bakers, but they were too popular for people of all beliefs, and instead Queen Elizabeth I passed a law permitting bakeries to sell them, but only at Easter and Christmas. Here in our country the buns are popular, especially in the eastern states in the springtime, regardless of beliefs. Ha’ is pronounced hay and meant a half-penny, which no longer exists in currency. There are also other versions of the ditty. There are many recipes for hot cross buns, but I have found one which I like and have adapted slightly, and am submitting the recipe. They are easy to make, the only caution is to be patient with the rising, as it is a fairly heavy dough, and takes longer. For this reason I put the dough in a covered bowl to rise overnight in the refrigerator, and take it out to come to room temperature and rise a bit more in a warm place, then make the dough into rolls and let rise again before baking. Combine yeast, sugar, and milk in electric mixer fitted with a dough hook. Beat on low speed one minute, add: the butter, egg and raisins. Whisk together 3 ½ cups flour, salt, and spices, then add and beat on slow speed until the flour is incorporated, then increase speed. If the dough is not leaving the side of the bowl, add rest of the flour, until you have a dough that is beginning to climb up the dough hook. Remove the dough from mixing bowl, and with your hands form into a smooth ball. Place the dough in a greased bowl and turn to oil it on all sides. Cover and set in a warm place to rise, or in the refrigerator overnight. Either way, let the dough rise and is ready to form into buns. Place the dough on a floured surface, and knead lightly, then pinch off pieces about 2- 2 1/2 inches in diameter, and roll them in your hands to form a smooth ball. With the seams of the ball down, place buns two inches apart on baking pan lined with parchment paper. Four buns should fit cross-wise in the pan. You should have about twenty buns. With a sharp knife, cut a cross on the top of each bun, about 1/8 inch down. Brush tops of buns with one egg which has been well beaten. Let rise again in a warm place. Preheat oven to 375 degrees. Bake buns about 15 minutes, turn and rotate pan and bake 10 minutes more, or until buns are golden brown. Remove to cool slightly on rack. Mix together 3 Tb. warm milk and enough powdered sugar (1 to 1 ½ cups) with ½ tsp. vanilla to make a smooth, fairly thick icing. (I place mine in a Ziploc small bag, cut a small hole in the corner, and pipe a cross over the indentations of each bun.) Buns can be served warm, or placed in the freezer for later. They will not keep very long, but can be freshened up with a quick run through the microwave. Hot cross buns should always be served warm!